J.P. Gagaza submitted this photo and caption. 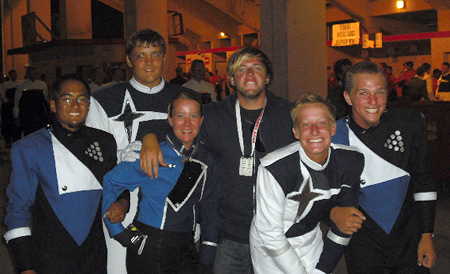 This photo was taken at the DCI World Championship Finals in Bloomington, Ind. Everyone pictured here is a 2007 Southwind alum. Going from the yellow of Soutwind to blue, the corps represented are the Blue Knights, Blue Stars, Bluecoats, and the snare instructor for Memphis Sound. We all just happened to run into each other at the exact same time while getting ready to line up for the finale. Left to right: J.P. Gagaza, Chris Rush, April Dalton, Matt Howell, Abbey Pelle, and Jacob Thompson.